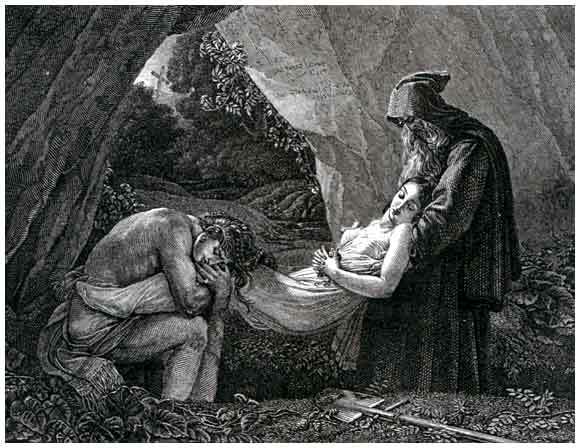 The Burial of Atala by Girodet-Trioson, Part 13 of the Introduction to Art and Artists of Our Time. From the picture by Girodet-Trioson. ANNE-LOUIS GIRODET DE ROUSSY, called "de Trioson," from a physician by that name who adopted him when very young, was born at Montargis in 1767, and died at Paris, in 1824. He inherited from his own family a large fortune, and this was increased upon the death of Doctor Trioson, who left all his fortune to his adopted son. Placed thus in a position of complete independence, he employed his time in imagining works which he either never carried out or which he finished only after labor, often out of all proportion to their intrinsic importance. His principal pictures are the "Endymion Sleeping," "Hipocrates refusing the gifts of the Persians," and the "Burial of Atala," the picture which we engrave, and which the reader may like to compare with the treatment of the same subject by a painter of our own times, G. Courtois, described upon page 101, where also the story is told upon which the picture is founded. FRANCOIS GERARD was born in Rome in 1770, of a French father and of an Italian mother. When still young he was sent to Paris to study art, for which at an early age he had shown a strong inclination, and after passing from one studio to another, he came under the teaching of David. He was no less influenced by the political ideas of David than by his views of art, and he threw himself at first with some ardor into the revolutionary area; but his real character was foreign to such manifestations, and he soon withdrew to the quiet of his studio, and gave himself up to more peaceful subjects than those in which he had assisted David: the design for the monumental picture to the memory of the murdered Lepelletier de Saint-Fargeau, and that for the Oath of the Tennis-Court. Gerard's chief pictures are the "Belisarius and his Guide," the "Cupid and Psyche," the "Battle of Austerlitz," and the "Entry of Henri IV. Into Paris;" but the first two named are peculiarly characteristic of his talent, and those by which he is most sure to be remembered.